I will be presenting for 400 seconds at a PechaKucha evening curated by Robert Mull and Kieran Long to launch the website of the Rip It Up and Start Again series. I will talk about re-imagining the project of planning in the era of disaster capitalism. Rip It Up and Start Again is a lecture series curated by Robert Mull and Kieran Long to place the work of the school in relation to broader debates about the city. At a conference a few weeks ago, some masters students came up to me and said that they had watched some video interviews with me as a part of their course, which they had found useful. I have attached them here below. Personally I find them unbearable to watch.. The first was filmed in 2008, and was recorded as one of a series of interviews that were made as a part of an EU funded research project into sustainability in design. In the interview I was asked to respond to a series of principles that the DEEDS team had formulated. 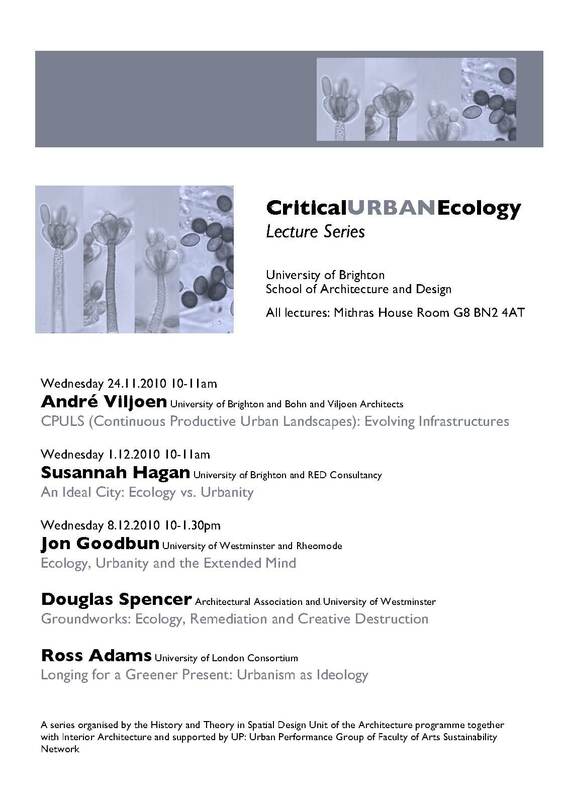 I am giving a paper at the concluding symposium of a lecture series on ‘Critical Urban Ecology’ organised by Karin Jaschke at the University of Brighton – together with Doug Spencer and Ross Adams. I know Doug well from Westminster – where we both teach (and finish PhDs) and the AA, where he organises the theory component of the interesting Landscape Urbanism MA. I have not met Ross Adams before, but I recommend his excellent recent critique of ‘Eco-Cities’ in Radical Philosophy journal. I will be first on and will give an overview of some concepts taken from ecology and in particular the development of the concept of metabolism in Marx and recent urban political ecology. I will briefly consider how metabolism has been theorised in neocybernetics, and will suggest how some ideas taken from Gregory Bateson might inform the development of these ideas today. Last year (2009-10) I ran a post-graduate diploma studio at University of the Creative Arts, Canterbury. This project by Chris Jennings-Petz was submitted by the school to the RIBA Presidents Medals competition. Ashford, an old Kent industrial/market town on the Stour river complex, plans to double in size over the next two decades, with 30,000 new homes. However, although Ashford has recently plugged-in to international rail networks, the town has remained formless, indistinct, unconscious. 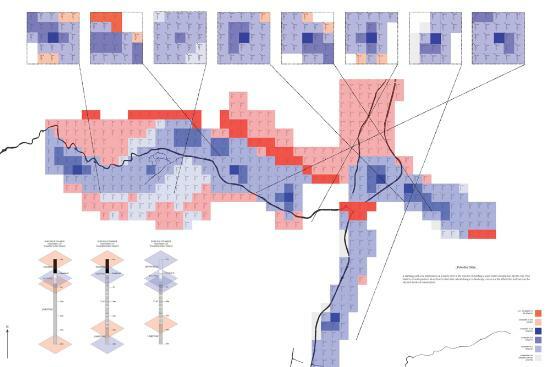 Research started with a mapping of the Ashford landscape as a metabolic entity, defined through demographic, infrastructural, economic, geological and urban flows. Forming what Bateson called “an ecology of mind”, this allowed intriguing insights into socio-geographical processes. Work soon focused upon socio-geological water flows, and included a novel report into the embodied water of building production. Through his regional analysis, major weaknesses were found in the city’s water planning. This issue defined the design strategy remit and project thesis. The hydrological, agricultural and geological surveys revealed a band of clay and aquifer running below the city. In an ingenious move, Chris chose this as the (sub)site, and proposed to excavate a string of region/city-defining reservoirs passing through the urban centre, slowly filling to meet the expanding water requirement. The waterside edges create a series of new urban landscape conditions, transforming land values, and introduce a new metropolitan space, and metabolic relation, into the heart of Ashford. A reservoir infrastructure was elaborated through a strong leisure programme, incorporating an ultra deep diving well, surface sports, a new ecological corridor with urban food production potential, and hundreds of floatation tanks. At the core of the scheme, the landscape both mounds, and drops to deep vertical wells, countering Ashford’s dominant horizontality. This move transforms the topography of the city, and perhaps reconfigures the cognitive maps of the city, in the inhabitants’ imagination. Working across scales, strategic regional moves were paralleled with 1:1 material prototypes that crystallised a series of open-ended experiments involving salt solutions and clay castings of various kinds. Samples and apparatus accreted around Chris’ drawing board through the year, defining a metabolic aesthetic. His evolving installations animated the diploma studios, whilst the proposal staged a urban landscape infrastructure, as a new ecological domain of social experience.